Today, I'm reviewing YA novel, Crossing the Line, by Ellen Valladares. To enter the giveaway contest, please complete the Rafflecopter form at the bottom...and check out the full book tour schedule for more chances to win and learn about Ellen, her writing tips and other reviews of this book! The novel opens in 1983, from 17-year old Laura Sherman’s POV, on the night of her death. This once bubbly cheerleader, known for her looks, personality and the drama-filled relationship with her boyfriend has now been trained through The Academy and assigned to make contact with the living to prevent the unthinkable from happening. Though the reader is left in the dark about who Laura’s target is and what horrible fate she is trying to save this person from, we do know The Academy Laura now belongs to has rules and “The Code” states that if a spirit is to Cross the Line, something worse than death will be their fate. Then, we meet Rebecca Mickelson, a serious, “facts only” journalist for the high school paper with a few close friends, who is only wishing her crush would ask her to Homecoming and that she won’t embarrass herself. Then, she and her friends encounter her mom’s old ouija board and they begin a communication with the spirit of a teenage girl. Filled with doubt and, secretly, a lot of fear, Rebecca soon learns the conjured spirit belongs to a former student of her own high school. Rebecca’s curiosity is stronger than her fear of the spirit world and after doing some online research learns that Laura Sherman, is, in fact, a girl who was murdered in their town 30 yrs ago. When Rebecca tells a little white lie to her English teacher to gain info about Laura Sherman asking if he knew her when she was a student there 30 yrs ago, it turns into a big story that starts to unravel quicker than Rebecca can follow. More and more people in Rebecca’s life and town knew Laura and have conflicting opinions about her. And Rebecca is charged with following the clues and finding out the truth of that night. While Laura Sherman is trying her best to follow and guide Rebecca to connect with the girl who truly needs Laura’s help and interception, she is drawn back into her own high school memories. Through observing Rebecca’s relationship with her friends, her boyfriend, and the loner girl at school, Laura finds herself fantasizing about former Life at St Petersburg South High School and is quickly losing composure and all of her training that states she must remain emotionally detached, lest she get closer and closer to crossing the line. What I loved about this book is the use of setting in both the imaginative afterlife world of The Academy and the real world of St Petersburg, FL: the sound of the waves, the smell of the beach and the ocean, the feel of sand and sun and the warm breezy nights that Rebecca and her boyfriend Tyler spend sitting on his pier, remind me of my teenage summers on Magician Lake, MI. I also loved the concept of The Academy and that spirits who were killed or hurt in a catastrophic way on Earth were trained to connect with and help the living who were doomed to face a similar fate. The character arcs were full and believable, transforming the popular beautiful, sometimes catty cheerleader into a heartfelt, sympathetic, and forgiving soul, also paralleling a stoic, slightly awkward shy journalist into a courageous, outspoken, brave and a bit flirtatious teenaged girl. The creepy allure is also a draw for me, the girl who loves mystery and has played the Ouija board as a middle schooler and high schooler, with some bizarre and spooky results. Ellen weaves mystery and a dangling carrot with each connection Rebecca makes, inching closer to the truth through encounters with a psychic, messages via Facebook and even visions. I’m a slow reader, but I seriously read the last half of this book in one day, snuggled up on my couch under the spring storms raging outside. All in all, I would recommend this book, It’s a light, face-paced read with some deep emotion in parts, romance and mystery throughout and a shocking twist ending. A great young adult whodunit novel for readers of any age! Four out of Five stars! But, you can win your own ebook copy by completing the Rafflecopter form below. Giveaway contest closes on April 28, midnight CST. Beverley Baird reviews "Crossing the Line" by Ellen Valladares. Readers won't want to miss this fast paced young adult novel! Ellen Valladares pens today's guest post at Kathleen Pooler's Memoir Writer's Journey. Don't miss this great post titled "Your Writer's Purpose -- how creating your purpose/vision can keep you on target" and learn more about Valladares latest novel "Crossing the Line". Mary Jo reads Ellen Valladares "Crossing the Line" and shares her thoughts with readers at Write Like Crazy. Anjanette Potter delights readers at Bookworm with her review of the YA Novel "Crossing the Line"by Ellen Valladares. Brandi at Spark the Wizard shares her thoughts in a review of Ellen Valladares novel "Crossing the Line". Wisconsin entrepreneur and school teacher reviews the latest novel by Ellen Valladares. Don't miss this opportunity to find out more about the YA Novel "Crossing the Line". Today, at Finished Pages, readers have an opportunity to learn more about "Crossing the Line" the latest novel by Ellen Valladares. Don't miss Renee's review of this YA Novel! Deborah Blanchard shares her thoughts after reading "Crossing the Line" by accomplished author and journalist Ellen Valladares. Eric Trant reviews the latest novel by Ellen Valladares. See what Eric thinks of "Crossing the Line"and find out more about this great book and accomplished author. 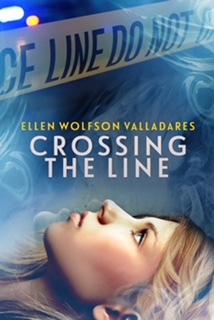 Phy reviews the delightful YA Novel "Crossing the Line" by Ellen Valladares. Today at Write Happy, Cathy Brown will be interviewing Ellen Valladares about her latest novel"Crossing the Line". Don't miss this opportunity to learn more about this YA Novel as well as hear some tips from the accomplished journalist and author Ellen Valladares. Crystal J. Casavant-Otto from WOW! Women on Writing reviews "Crossing the Line" by Ellen Valladares and shares her thoughts with readers at Valladares blog. Brittany shares her thoughts after reading "Crossing the Line" by Ellen Valladares. Don't miss this insightful blog stop for this delightful Young Adult Novel! Melanie at Frasers Fun House reviews "Crossing the Line" by Ellen Valladares. Elizabeth at Word Nerd reviews the latest novel by Ellen Valladares. You won't want to miss a minute of this captivating YA Novel "Crossing the Line".